Çırağan Palace was built by order of sultan Abdülaziz on the Bosphorus, between Besiktas and Ortaköy on the site of the former old Çırağan Palace, which was built by Kirkor Balyan. In the 17th century, the area between Beşiktaş and Ortaköy was called “Kazancıoğlu Gardens (Bahçeleri)”. In the 18th century, the grand vizier Ibrahim Pasha, who was given this land by Sultan Ahmed III (1703-1730), built the mansion for his wife Fatma Sultan, who was a daughter of Sultan Ahmed III. “Çırağan” means “lighting” or “festival” in Persian. It is thought that the name came from fireworks, which were displayed at many banquets and festivals organized in the gardens of the mansion by Ibrahim Pasha. Çırağan Palace was designed by Nigoğos Balyan and constructed by his sons Sarkis and Agop Balyan between 1863 and 1871. For the construction of the palace, the finest marbles, porphyries, mother-of-pearl and other valuable materials were brought from all over the world. Sultan Abdülhamid II (1876-1909) presented German Empire, Kaiser Wilhelm II one of the precious doors with mother-of-pearl, which was brought to the Yıldız Palace, Şale pavilion from the Cırağan Palace. 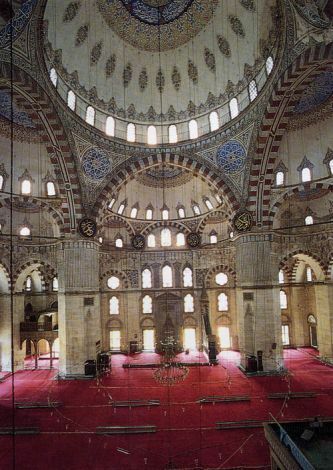 The construction of the palace and the interior decoration in Arabic style was completed in 1872. The palace is a complex of buildings including Main Building, Harem and Ağalar Dairesi, and has an area of 80,000 square meters. It is connected with a beautiful marble bridge to the Yıldız Palace Gardens on the hill behind. The wall paintings and some of the ornamentation were the work of Chief Court Painter Haci Mıgırdich Kalfa, and the rest of the wall and ceiling ornamentation was executed by Sopon Bezirjian, Ohannes Ajemian, Tavit Tıriants and Mıgırdich Jivanian. After the death of Sultan Abdülaziz (1861-1876), Sultan Murad V (1876) settled here, but reigned for only 93 days. He was deposed by his brother Abdülhamid II due to alleged mental illness, and lived here under house arrest with his family for 29 years. During the Second Constitutional Monarchy, Sultan Mehmed V Reşat (1909-1918) allowed the parliament to hold their meetings in the Çırağan Palace. In 1910, a big fire destroyed the palace, leaving only the outer walls intact. In 1989, the palace was restored and a modern hotel complex in its garden along the Bosphorus was added. The ground floor of the main palace, and the apartments of the separate Harem and guard blocks, was used for many years as Beşiktaş Girls High School and city transport office warehouse. The palace was renovated again in 2007, and today it serves as a luxury hotel. Reference: Selman Can, Belgelerde Çırağan Sarayı (Ankara: Kültür Bakanlığı, 1999).